We were not able to examine material of this species. Jaasund (1976) describes this species as follows. “Plants moss-like, forming 1-2 cm thick mats. Horizontal axes procumbent, attached to the solid substrate by disk-like haptera developing on ordinary branches. Erect branches about 100 µm thick, little branched, curved and becoming narrower upwards. 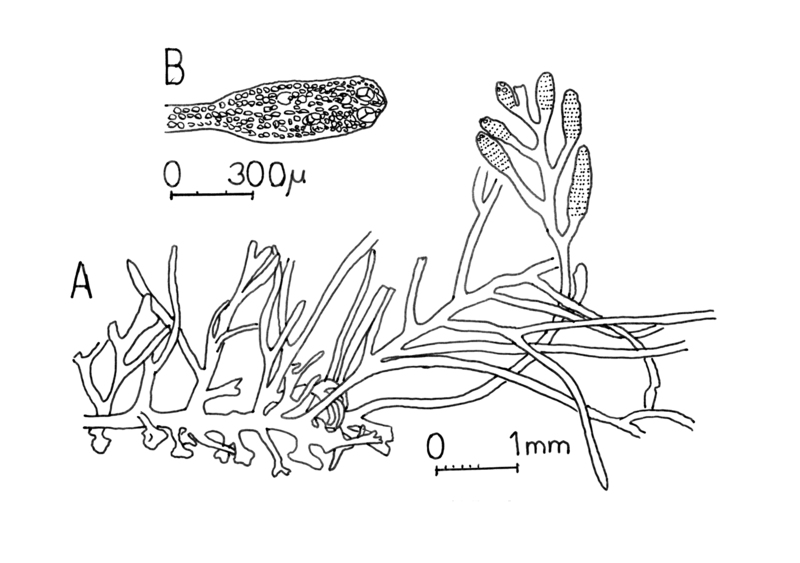 Thallus is polysiphonous and not corticated like the other two species [B. tenella and B. binderi, now both regarded as B. tenella]. Tetrasporangia develop in stichidia, flat expansions on ordinary branches. They are about 200 µm broad. Growing in mangrove swamps on pneumatophores …” Lambert et al. (1987) note that their specimens are “About 1 cm tall, each pericentral with two pier cells per axial cell. Main axes and branches regular, polysiphonous, uncorticated”. Found on mangrove bark and pneumatophores from Kei Mouth to northern Kwazulu-Natal (43-58) (Lambert et al. 1987). World distribution: Widespread throughout tropical regions (Guiry & Guiry 2010). Type locality: French Guiana (Silva et al. 1996). Guiry, M.D. & Guiry, G.M. 2010. AlgaeBase. World-wide electronic publication, National University of Ireland, Galway. http://www.algaebase.org; searched October 2010. Jaasund, E. 1976. Seaweeds in Tanzania: A field guide. pp. 160. Tromsø: University of Tromsø. Lambert, G., T.D. Steinke & Y. Naidoo. 1987. Algae associated with mangroves in southern African estuaries. I. Rhodophyceae. South African Journal of Botany 53(5): 349-361. Montagne, C. 1842. Bostrychia. Dictionnaire Universel d'Histoire Naturelle [Orbigny] 2: 660-661.